Our nation comes together to honor our service members, veterans, and fallen soldiers in a variety of ways throughout the year. We say thanks to all veterans past and present on Veterans Day, and on Memorial Day, we take time to remember those who sacrificed their lives for our freedom. But one unique way to show appreciation to our fallen veterans and their families is by laying a wreath on veterans' graves through Wreaths Across America in December. Join MilitaryByOwner and Wreaths Across America in honoring our nation’s veterans this month. Wreaths Across America started with one man and the desire to honor our nation’s veterans. Morill Worcester, owner of Worcester Wreath Company, was moved by a trip he took to Arlington Cemetery when he was a boy. The Worcester Wreath Company had a number of wreaths left over from the season, and Morill had the idea to lay them in the older part of Arlington that saw fewer visitors. Volunteers donated their time to dress the wreaths with bows, transport them, and lay them at the cemetery. This simple act went on for years until 2005 when pictures of the wreaths at Arlington circulated the internet and thousands of people asked how they could get involved. In 2007, the Worcester family, veterans, and a few other groups and individuals created Wreaths Across America, a non-profit organization created to expand their efforts in honoring veterans. And in 2014, Wreaths Across America met their goal when 226,525 wreaths were laid and every grave was visited at Arlington Cemetery. 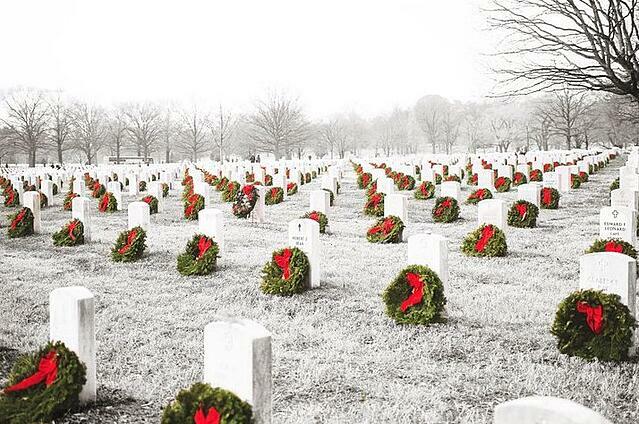 Today, Wreaths Across America makes it their mission to Remember, Honor, and Teach. With the help of many donations and volunteers, they continue to lay wreaths at Arlington, as well as cemeteries across the country and overseas. But their effort doesn’t end with the laying of a wreath. 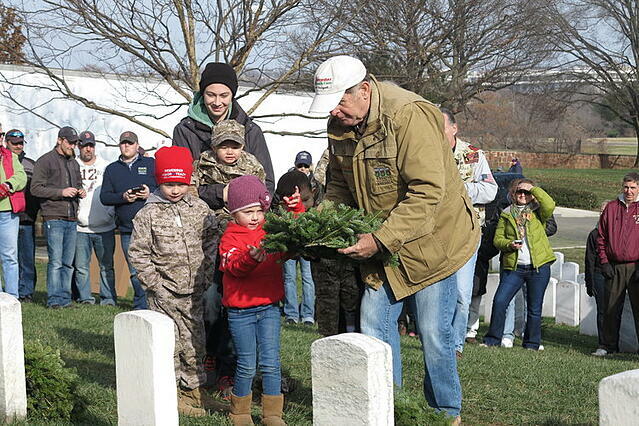 Wreaths Across America offers learning tools, interactive media projects, and opportunities for schools, 4-H, scouts, and other youth groups to participate in their efforts. And their heart to teach extends beyond school walls. They reach a much broader audience with their internet radio station and blog where they share veterans' stories and the continuing mission to remember, honor, and teach. This year, MilitaryByOwner is a proud sponsor of Wreaths Across America. MilitaryByOwner co-founder Sharon Gran reminds us, "It’s important to come together as a community and show our gratitude and respect for our fallen. From previous years of volunteering, it’s very moving to see each grave decorated with a wreath." Visit the MilitaryByOwner Wreath page to donate a wreath to be laid at Quantico National Cemeteries. You can also sponsor and volunteer at a cemetery near you. For those wanting to participate at Arlington National Cemetery in the D.C. area, check the Wreaths Across America site for specific information. MilitaryByOwner will match the number of wreaths donated up to $1000. What was once a local tribute for veterans each year is now a nationwide effort. With the help of volunteers and donations, Wreaths Across America creates an incredible opportunity for people all over to honor our country's veterans.